Note: References to plot from previous books. October Daye is settling in to her new role as a countess in Faerie, she is dating again, and all seems relatively calm. So of course it is time for things to go wrong. The children of the regent of Saltmist have been kidnapped and the Queen of the Mists stands accused. In three days the Fae of land and sea will go to war, unless Toby can find the missing boys. While there are those who will stand in the way of Toby, there are others who will always stand with her. But in a time of war, not everyone survives. After being saved by her mother in Late Eclipses, Toby is now working on finding balance again: with her stronger Fae abilities, with her new title as Countess of Goldengreen, and with her reblooming relationship with Connor. When the news comes that the sons of the Saltmist Duchy have been taken, Toby is tasked with discovering where they are before war begins between land and sea. When the task becomes personal, Toby will stop at nothing to save the children - no matter the cost. I thought that it would be difficult to top Late Eclipses, but I should have known better. This book builds upon everything that Toby has been through the past stories and keeps leading her down the path of change. This is definitely a pivotal book, as relationships with many characters begin, end, and transform. McGuire's ability to make Toby strong and vulnerable shines in One Salt Sea, and her continued relationship with children, her own and others, show the parallels to Toby's own views on her relationships with her mother, her foster families, and the one she is creating around her. It isn't only Toby that amazed me in this book. The triangle of Toby, Connor and Tybalt comes into play and demonstrates how she can feel so "differently the same" about two men. The Luidaeg, Quentin, Sylvester, May and others all are woven into a strong story of how one person can be tasked to stop a war between races, but can continue to find others to fight. The hints at the end of what we will see in the next stories leave me anxiously anticipating Ashes of Honor next fall. 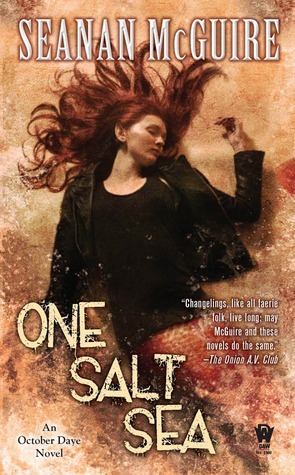 I admit I am a total fangirl of Seanan McGuire (and Mira Grant, her other writing alias). If you have not started this series yet - do it. You won't be disappointed.